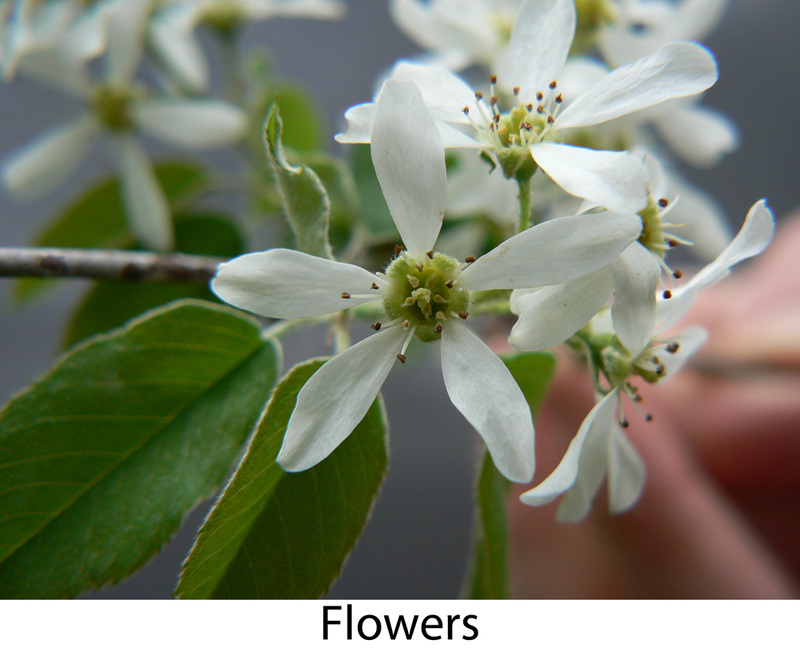 Amelanchier sanguinea.flowers.Pépinière Saint-Nicolas.test.pns3.com (Accessed 5/2016). Flowers white, 5-parted, stamens, 20; in open, spike-like clusters (racemes) 4-7 cm long, at time of blooming; without leaves except at base; top of ovary densely hairy in flower, lowest flower stalks (pedicel) 1.5-3 cm long; calyx (hypanthium) 0.7-0.9 cm wide just below lobes after petal fall; sepals 0.2-0.4 cm long, curving downward (recurved); petals free, linear to narrowly oblong (spatulate) 1-1.5 cm long; ovary wooly at top. 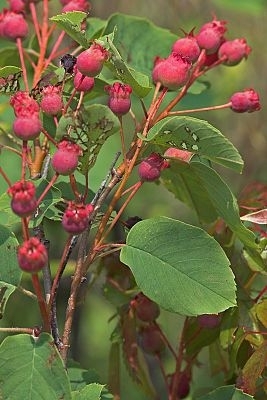 Amelanchier sanguinea.Pépinière Saint-Nicolas.psn3.com (Accessed 5/2016). Fruit fleshy, juicy, red becoming dark purple, often wooly at top. Habitat: Open woods, neutral soils.